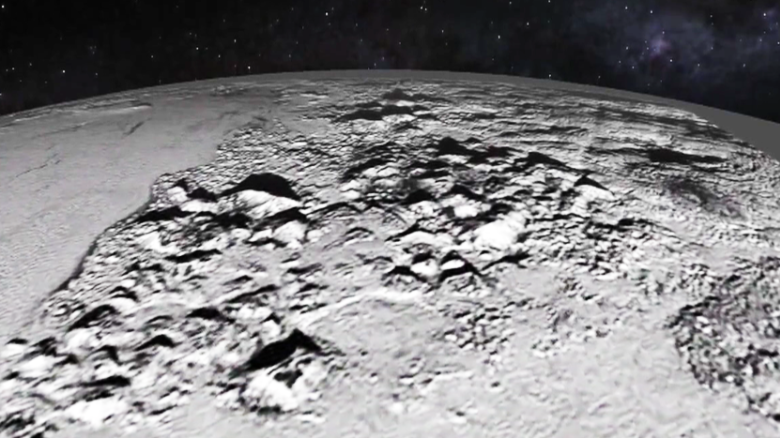 (CNN) Dwarf planet Pluto may be hiding an icy ocean beneath its surface, according to two new reports published by the scientific journal Nature. The papers seek to explain why Sputnik Planitia — a 1,000 kilometer-wide, nitrogen-covered basin in Pluto’s heart-shaped northern region — is permanently aligned with the dwarf planet’s moon Charon. “It’s like they’re in an arm-to-arm dance, always facing each other,” said Richard Binzel, professor of planetary sciences at MIT, who was involved in the New Horizons mission to Pluto. The first paper, from the University of Arizona, suggests that Sputnik Planitia filled with ice and altered tidal forces between Pluto and Charon. The second, from the University of California, suggests the reorientation was caused by tidal forces as a result of a “slushy,” partially-frozen underground ocean. Clues emerged from data gathered from NASA’s New Horizons space probe, which passed by Pluto in July 2015. Researchers from the Massachusetts Institute of Technology have been a part of the New Horizons team. “A thick, heavy ocean, the new data suggest, may have served as a ‘gravitational anomaly,’ or weight, which would factor heavily in Pluto and Charon’s gravitational tug-of-war,” according to MIT News. Sputnik Planitia is thought to have formed billions of years ago when an asteroid slammed into Pluto’s surface, leaving behind a crater that filled up with nitrogen ice within the last 10 million years. NASA’s New Horizons mission, which launched in 2006, captured images of this luminous region when it passed by the dwarf planet last year, providing a wealth of new information about Pluto. “We think Pluto may have had its atmosphere almost as thick as the Mars atmosphere which is pretty amazing,” Binzel said.